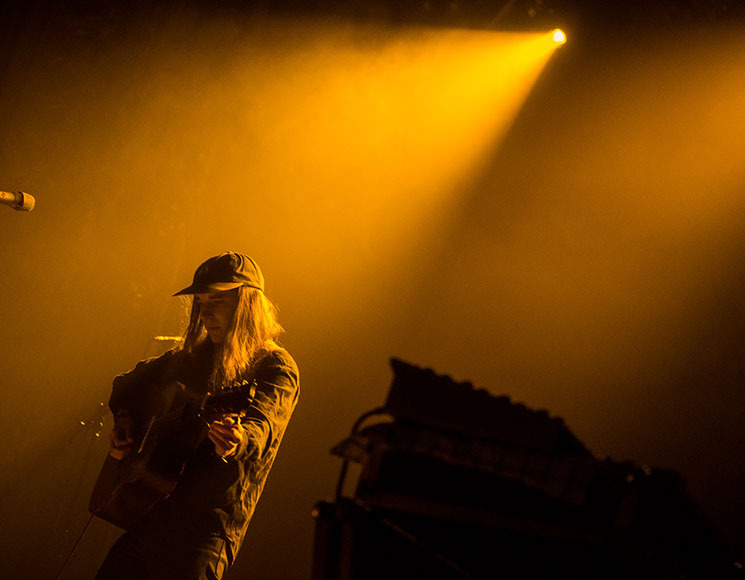 Yellow beams lit Andy Shauf from behind, holding his back as he bobbed. His music has always been the kind of cool that takes its sweet time, but momentum was lost on Thursday night. Shauf hasn't put out a new solo record since 2016, and his set was well-worn; it was all flat horizons and couldn't get up from the couch. Shauf gingerly tossed obligation to the audience, asking for questions because he said he didn't have any stories to tell. We learned his favourite colour (red), favourite song ("The Boys Are Back"), and favourite fruit (cantaloupe). Someone asked him if ants have toes. He seemed tired — earnest, but weary. For all his lugging, Rialto Theatre was overjoyed to receive him. "You guys are rowdy. Thursday night," said Shauf, in a kind of wondering voice. The pauses between songs were not awkward, but adoring; whoops leapt from the balconies when he started up again. They froze in mid-air to watch as he bunched story-lyrics through his egg-yolk slur. Shauf appeared alone for the encore. He evaded playing an old favourite — "That song is such a bummer" — but the crowd was jovial about hearing a new song, and Andy, ears poking out from his hair, looked happy to finally be playing one.